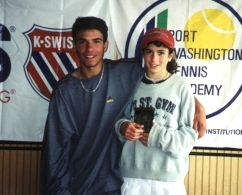 I first met Josh & Julia Cohen when they came to play the 2000 Port Washington Easter Classic (picture at right). I was impressed with both players as Josh took third place in the Boys' 18s (he had previously won the event in 14s and 12s) and Julia won the Girls' 12s event. Josh was back at PWTA a few months later to win the Port Washington International Championships, his first ITF title while younger sister Julia was also collecting trophies. Seventeen year old Josh Cohen's most recent accomplishment was a fourth place finish at the Easter Bowl. Since his PW International win, he has been playing mostly ITF events, with singles and doubles semifinal finishes at the Asuncion Bowl, the Milo Cup, the Venezuela Championships, Chandra Rubin Internationals and the Frankfurt International. This week's ITF Rankings have Josh at No. 42 in singles. Josh has also made a showing on the USTA junior circuit. He is currently ranked No. 15 in the USTA Boys' 18 singles and has USTA first place wins from the Junior Spring Fling, Copper Bowl and Franklin Winter Championships. The junior tennis beginning for Julia Cohen came in 1998 when, at the age of nine, she was the consolations winner at the Franklin Indoor Championships, a winner at an event in Detroit and the youngest player to compete (and advance a round) at the Orange Bowl. From there she continued to play and win. The most impressive fact about thirteen year old Julia is that she holds titles in USTA 12,14,16 & 18 events. She has been ranked No. 1 in the 12s all year and is now working her way up the 14s where she remains at No. 13. Most recently Julia has placed third in the Easter Bowl Girls' 14s and won the National Open event at Naples, Florida in the Girls' 18s. In 2001 alone, Julia's singles titles included the USTA Super National Clay Courts & Hard Courts, the Easter Bowl and the Spring Fling.